Champion is the most successful watch brand in Brazil – the sixth largest economy of the World – and one of the major players of the international watch industry. Since its foundation in 1978, Champion has been dictating fashion and influencing the direction of the Brazilian market. Champion and innovation are synonymous, which combine modern elements with the glamour and sophistication of precious materials. Focused on fashion and style, Champion always surprises. The models have exclusive details, bold design and vibrant colors. The collections incorporate and anticipate fashion trends, recall references from different times and reinvent these styles to reflect the individuality of each person. Always with a contemporary touch and flawless workmanship, Champion pleases different styles and personalities. More than 4,000 different models comprise the collection. 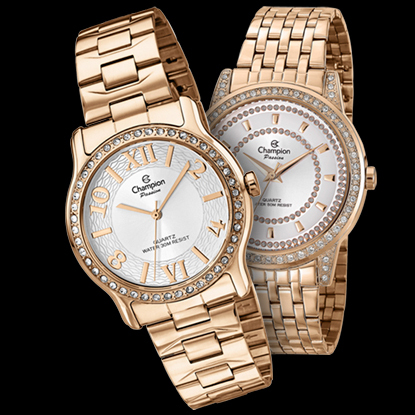 From colorful and shiny to elegant chronographs, with modern or classic dials, with bracelets of different textures, some that are sophisticated or adorned with crystals, Champion has one of the most complete ranges of models. With watches irresistible in form and unbeatable in function, Champion is ready to conquer a world that is becoming ever more demanding and eager for innovation. Copyright © 2016 Magnum Group. All rights reserved.